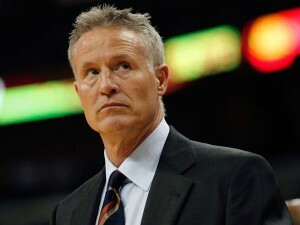 How Much Pressure is on Brett Brown? That’s what I answered when asked about the 76ers 2016 media luncheon (namely because I wasn’t invited). However, this was also the phrase used by Head Coach Brett Brown at the aforementioned luncheon when asked for a win total goal for the upcoming season. The exchange between Brown and the media was symbolic of what the fourth-year lead man of the Sixers can expect this upcoming season; pressure and expectations. Let’s keep realistic…on paper the Sixers still don’t blow anyone away. However for the first time since taking the helm in 2013 Brown is working with a legitimate NBA roster. In the past, a lot of the media and blogosphere have withheld and reserved any critique of the ‘Bostralian’ due to the “tanking / process” circumstances at hand. That won’t be the case during the 2016-17 season. Sam Hinkie stated in Brown’s introductory presser that both were aware of the journey that was ahead and both men were prepared for it. That’s why Brown’s original contract was for four years instead of the traditional three. Brown was also extended for an additional 2 years back in December 2015. Brown took the reins of a roster still frugally sprinkled with veterans. My favorite, Thaddeus Young, the lone survivor of the Eddie Jordan era, would soon be off into the horizon along with every other name on that roster that isn’t Hollis Thompson. The three seasons that followed were not suitable for the eyes of children as the team reached historic levels of futility. This year’s Sixers come equipped with guards Jerryd Bayless and Gerald Henderson who bring over a dozen collective years of NBA experience, along with a host of, get this, RETURNING wings and bigs. Plus the highly anticipated debut of Joel Embiid and the addition of No.1 overall pick Ben Simmons. Not to mention Sergio and Dario who have been playing professionally overseas. If we are lucky, Brown can add flavor to his patented “vanilla offense”. This year’s edition of the Sixers won’t be so wet behind the ears, and Brown, for the first time will be expected, albeit modestly, to produce. The qualifier there is what makes this not so cut and dry. There is a big enough margin for the team to be head and shoulders above last year but still waist high to the rest of the League. For this piece I tried to find a good reference point. To compare Brown’s situation in 2016-17 with that of a prior NBA head coach in order to find reasonable expectations for him and his team during this upcoming season. Such a situation doesn’t exist. Not to this extreme. Even the ’98 Nuggets and the ’97 Grizzlies had solid pros and recognizable names to coach. I looked at the ’04 Hawks but even they had Jimmy Jackson, who, for my money, would’ve been the best player on the 76ers roster last season. And not the ’04 Jimmy either. We haven’t been able to grade Brown, at least not on wins and losses. And developmentally the roster has had too high of a turnover ratio to really tell if anyone’s game has progressed significantly. Strategically, Brown is known to be one of the best in PTO’s (plays out of timeouts). The squad was above League average in plays off the inbound in such situations despite the obvious talent mismatches. This speaks a lot about Brown and provides hope for what he can do with a more versed group. The Philadelphia market is a smart one, and I don’t think anyone is calling for Brown’s job for a sub .500 season. However I do think this team needs to win a minimum of 25 games to prove relevancy and direction. The experts in Las Vegas and our friends at the wagering site Coral News have set the Sixers over/under for wins at 27.5. Which means the 76ers won’t contend this season, we probably won’t be good this season, but we need to be an actual entity. This is important because losing and winning cultures are very real. As real as the Popovich-esque beard on Coach Brett’s face. Reality also states that there is still a likely chemistry-shaking trade on tap that won’t make the 2016-17 season any easier. The NBA scheduling Gods hold true to form as the Sixers start the season off with an intimidating schedule, complete with the famous December Disney on Ice road trip. In the end, I could see the team in the race for the final playoff spot in the east even if falling short and playing the Lottery subsequently. While the time is upon us to expect forward progress and I am fully confident this group will resemble a professional basketball team, it is vital we remain real and temper our expectations. Unless, of course, Joel Embiid. In which case, I will print the t-shirts.